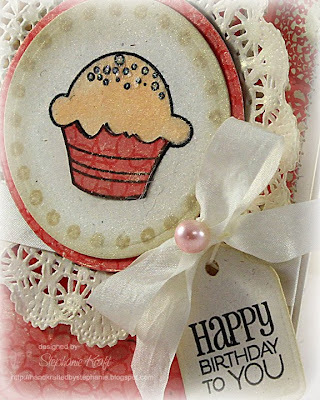 If you are looking for my Sparkle Creations Release Day post, please scroll down or click HERE! Hello! Happy weekend! 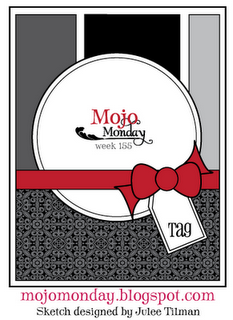 I have a few friends with September birthdays, so I thought I should get going on some cards before they become belated birthday cards.. : ) I also wanted to play with the latest Mojo sketch. Accessories: Standard Circle Nestabilities, Tags Five Shapeabilities (Spellbinders); Markers (Copic), Star Dust Stickles (Ranger), Coarse Crystal glitter (Martha Stewart), Iridescent Pearl Glimmer Mist (Tattered Angels), Wrinkled ribbon, Twine (May Arts), Pearl (Prima), Doily (from Sarah Martina's Etsy Shop), Foam tape, Thread, Sewing machine. Really lovely card, Stephanie. Wonderful design work as always. So cute, Stephanie! 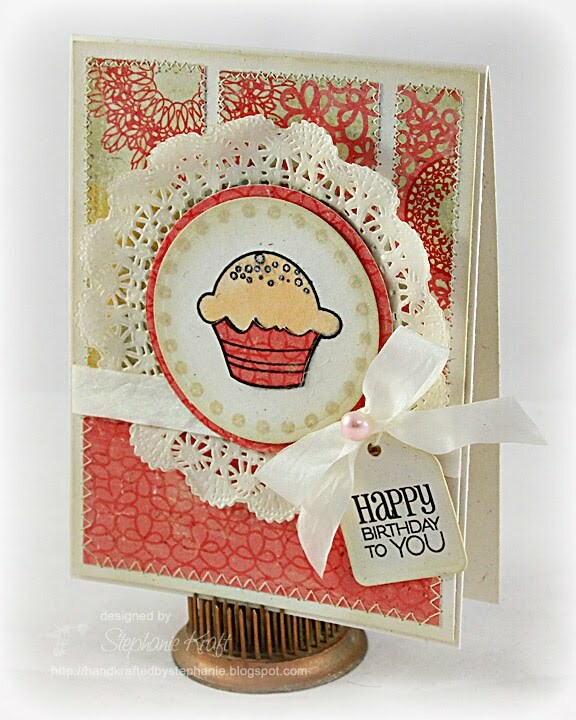 Love the cupcake with all it's "sprinkly" goodness and that fabulous doily backdrop. Wonderful colors as well! Very pretty!!! The papers are perfect and I love the look of the glimmer mist!! What a darling card Stephanie! I know how much I love cupcakes ;) Love the shimmery sprinkles on top! Oh yum, I love cupcakes and I love your card, Stephanie! Oh how GORGEOUS, Stephanie!! I really need to get some doilys....they make such BEAUTIFUL accents on cards! Stephanie, this is gorgeous and oh, so sweet! Beautiful colors and patterns. Really heart the ruffled edged doily. Great look and design! Did you wet it to get that nonflat look or just manipulate it with your fingers? Fabulous dimensional detail! Lovely card! this is soooo adorable, I am having a Verve stamps giveaway on my blog, check it out and tell your friends! Beautiful and soft. So very lovely!